I’m at a whole different stage of my parenting now. This is just one of those seasons where I am just really into the throes of motherhood to the point that sometimes I keep attempting to peek beyond this season into the next. It’s like bobbing up and down in a pool for a breath of fresh air. And, you know, that may not be the best analogy for parenting. I want to reiterate the fact that all mothers know: parenting is hard work. Yet, I want to also note: parenting can be a beautiful process. It all depends on which choices we make. It’s imperative for me in my life right now, to take the reigns on my kids and drive. While they are young and impressionable, this is the time allotted, the window of opportunity, for us (my husband and I) to speak into their lives and teach them those timeless truths they won’t learn any easier than right now. And that, my friend, is the hardest part in the younger years. (If you have teenagers, please don’t remind me that it gets harder as time goes by!) I am really doing my best to think positively and believe that there is a good chance all of this teaching and training we are doing today will sink in and take root before they are teens! But we all know- kids have a mind of their own. My prayer is that my daughters will adopt the mind of God- thinking Godly thoughts and acting in Godly ways. Hence, the work laid out for me today is crucial. In our home, (and as you know, we are homeschooling), we have been doing a lot more character development studies recently. If I see a problem in heart or attitude that needs correcting, the first thing I want to do is go to the Word of God. God’s Word literally is an anecdote to all problems, and there is a solution to every dilemma under the sun right in the Bible. That’s why we have the Holy Spirit with us- He is living, He is breathing, He is working, He is real, and best of all, He is IN us who believe! Right now, for my 2 year old, discipline is as basic, primitive and rudimentary as it comes. But that doesn’t mean she can’t understand when God is happy. She will often tell me (after doing something fabulous like picking up the toys from the living room floor), “Mommy, you happy? God is happy?” and she will skip cheerily away, just knowing that she’s done a good thing. Kids know, even at the very tender ages of 1 and 2. So, it’s never too young or too early to start them on the Truth of God’s Word for instruction. And the biggest thing is- correcting and instructing in a spirit of Love (the way our Heavenly Father so patiently loves us). I know, it takes a LOT of time to discipline that way. To have children look up scripture pertaining to their heart attitude and then have a heart to heart with them, pray over them…that takes a lot of time. It is oftentimes far easier to send them to time out, spank them, or take away a privilege. 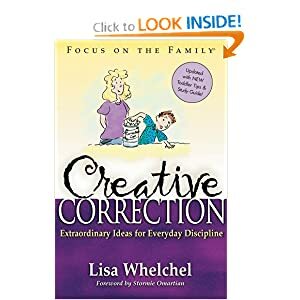 But with those methods (none of which I criticize and some of which I use depending on the situation), there is real no connection that lets my kids know WHY what they did is wrong, and how our Heavenly Father FEELS about what they did. But in the end, I pray and I believe- it will all be worth it. Honest and great advice. I will have to seriously consider starting this with my children. Thanks for sharing!